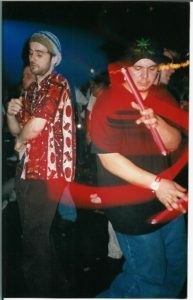 The awesome Brandon Sweet rejoins us to continue our discussion of the rave scene this week! Super duper thanks to host and supreme podcast overlord Bianca not only for allowing Brian to dredge up this topic again, but also for taking the lead and turning the episode into an interview. And as always, a big thanks to our listeners for contributing thoughtful emails! The song at the end of this week’s show is Back Again by Run Tings.